It is no secret that the Matrix creators are Anime / Manga fans, borrowing liberally from the classic Ghost In The Shell. Here their new muscle gets put to brilliant use by contracting some of the world's leading animation talents to tell Matrix related stories in this unique and intense format. The nine short films each have their own character and levels of emotion, texture, style, action and philosophy - but all umbilically tied to its Matrix generator. 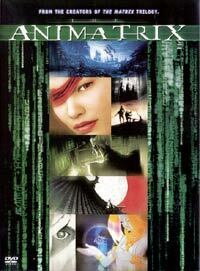 Four of the segments were written by Matrix fathers Andy and Larry Wachowski. The directors include Andy Jones, Mahiro Maeda, Shinichirô Watanabe, Yoshiaki Kawajiri, Koji Morimoto and Peter Chung. You cannot miss this. Here's proof that animated art is not merely reserved for kids. For the ultimate version with extra features check out the DVD which includes making-of featurettes, selected commentary tracks and a documentary on the artform, Scrolls To Screen: The History and Culture of Anime.